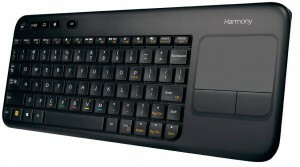 New Logitech Harmony Smart Keyboard Exclusively @ Best Buy!! Setting up this device or getting started is as easy as 1,2 and 3. Step 1- Position the Harmony Hub. If you wish to place the device on an open shelf then place the hub on one of the shelves in an unobstructed location. If you wish to place the device in a closed cabinet then place the hub inside the cabinet and the IR mini blaster on top to control your TV. (*IR signals from the hub and IR mini blasters reflect off walls, interiors, and other surfaces before reaching your devices- direct line of sight is generally not required). Step 2- Power up your Harmony Hub. Once plugged in, the hub takes approximately 30 seconds to power up. There is a small button on the back of the device that you will need to hold down for a couple seconds, once the hub starts to blink or flash you will then be able to sync it with your Wi-Fi for internet connection. Step 3- Install the setup app. Visit the Apple App Store or Google play and install the Harmony App. Launch the app select the Setup New Remote button, and follow setup instructions. From the moment I opened up this package, I have not been able to put it down. I love this new Logitech Harmony Smart Keyboard and would rate it 5 out of 5 stars. Here’s all the reasons I enjoy using this device and how it has truly simplified my entertainment needs. Before I was lucky enough to have the Harmony Smart Keyboard in my life I would have to constantly surf the TV for something good to watch, change my TV inputs back and forth whenever I wanted to play my PS3, and use my PS3 controller to navigate and type anytime I wanted to check out the PlayStation Network. But I honestly feel like I live in the stone age no longer!!! I first powered on my Harmony Hub and synced it with my Wi-Fi. I then placed the two micro USBs into two devices I use most frequently (my Insignia 55″ TV and my PS3). I also chose these two devices because the TV is not Bluetooth compatible and even though the PS3 does have Bluetooth capability, I rarely ever use it. I then downloaded the Harmony app from the Apple Store onto my iPhone 4s and followed each step that the tutorial walked me through. Once I was done connecting my iPhone and iPad to the Setup New Remote button, each device now worked as a universal remote. Anytime I need to turn on / off my TV, adjust the volume, surf the web, select which channels to watch, change inputs, or any other command- it could all be done through the Harmony app on both my iPhone and iPad. You can also select personalized preferences as to which TV channels are your favorites so no longer surfing aimlessly for hours trying to find something good on TV. I have personally selected ESPN, USA, Fox, Comedy Central, and FX to name a few, and anytime I want to watch any of those channels its just a press of a button away. The device turns on the TV for you and goes straight to the selected channel. There is also a Movie Activity button on the keyboard that when selected goes straight to my Hulu and Netflix accounts. But here is the part that really sold me. Anytime I wanted to play my PS3 I would have to turn on the PS3 manually, turn on the TV with the remote then select the correct input. Now I can play video games with the press of ONE button. When selected, it turns on both my TV and PS3 AND switches to the correct input. So instead of three steps, it can now be done in one. Whenever I get tired of playing video games and wish to watch TV or a movie instead, I simply select the desired command and it automatically shuts down my PS3 and switches to the correct input. Simplicity at its finest. The keyboard itself has a non slip coating which really gives it a great feel and keeps it from sliding off your lap. It requires 2 AA batteries but still maintains a very light weight. There is also touchpad (instead of a mouse) which is a specialized surface that can translate the motion and position of a user’s fingers to a relative position on screen. Logitech specifically mentions support for Apple TV, Xbox One, Xbox 360, PS3, Mac/PC computers, and Roku devices. Overall I am extremely impressed and would definitely recommend that you go out get your hands on the Logitech Harmony Smart Keyboard available exclusively @ Best Buy until 6/21/2014.